Above: 1997 Dodge Ram SS/T by Tim Slayton. Featured in the Mopars Of The Month Section June 2004. Click Here to check out Tim's SS/T. The 1997 Dodge Ram SS/T took the sport truck image to a new level for full-size pick-ups. A specially-tuned 250-horsepower 5.9-liter V8 engine, chrome-tipped sport-tuned exhaust, a muscular 17-inch aluminum wheel and performance tire package, and Viper-like racing stripes set this truck apart from the pack. The Ram SS/T evolved from Dodge's success with the special edition Indy Ram, the official truck for the 1996 Indianapolis 500 that was produced in a limited run of just 2,802 vehicles to support Dodge's role as Official Pace Car with the 1996 Viper GTS. When demand for the Indy outweighed supply for the truck, Chrysler realized they had a hit they found out the appeal wasn't just in the tie-in to the race, but in the inherent performance characteristics of the truck. Chrysler paid Careful attention to maximizing content on the truck without pricing it out of the customer's reach. 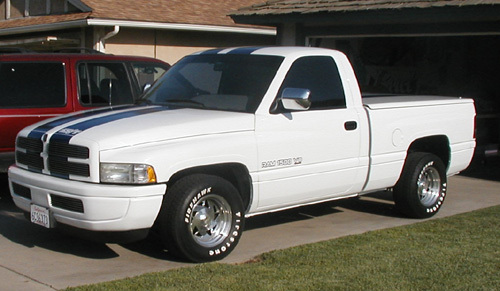 The 1997 Ram SS/T includes all the standard features on the Ram SLT. The SS/T package includes the engine and exhaust modifications, the racing stripes, color-keyed bumper, grille, lower fascia and rear valance panel, tachometer, dual-note horn and fog lights. Exterior color choices include black, emerald green and flame red, all with silver stripes, or bright white with blue stripes. The SS/T is Destin to be collectable considering the limited 2 year production. Information found in this section is believed to be accurate. The 440magnum Network assumes no responsibility for errors or omissions in anything that is referenced by or linked to this site. This information is provided "as is" and was obtained from DaimlerChrysler Corporation, WWW, Books and other Reference Materials.